About 5,000 AFVs since 1948. The Jews probably suffered the worst case of organized genocide in history, and the trauma associated in 1945 for the survivors of the Shoah re-launched and firmly grounded the idea of a return to the original homeland, an idea professed by several XVIIIth Diaspora’s intellectuals and in the XXth century (known as the Zionist movement). This movement led many European Jews fleeing from the past Russian persecutions and pogroms (Especially in Ukraine) to settle in Germany and the Western countries later, as well as immigrate in Palestine, a British-held territory after WW1. The treaty of Vincennes indeed saw former Ottoman Empire territories of the area falling under French and British control. Following the Balfour declaration in 1917 which saw in a favorable way the establishment of a Jewish state, the Zionist movement grew with ten of thousands of “pioneers” (halutzim) settling in Palestine but soon confronted with a strong Arab resentment. This was of course caused by these territory occupations that led to 1929 riots, and at the end of the 1930s, full-scale civil war, with both the constitution of a Jewish and Arab legion and militias. In 1936-39 the Arab revolt led the British authorities to form a public inquiry commission headed by Lord Peel, and a white paper in 1939 professing the containment of Jewish territories in Galilee and western coast, with further relocations of Muslim populations, fuelling even more anger. At the same time in Germany Nazi persecutions amplified the phenomenon of mass-emigration. During WW2, Muslim authorities became more favorable to the axis, whereas a Jewish brigade was levied and incorporated into the British Army. It would serve with distinction in the whole North African campaign, Sicilia, Italy, the low countries and eventually Germany. Most of these veterans would later become officers in the young Israeli Army. By 1945, the Zionist movement however suffered from a rather hostile British policy, and after the pro-British Weizmann (a former RAF pilot) leadership, the movement passed to the Jewish Agency in Palestine led by the anti-British Socialist-Zionist party (Mapai) headed by David Ben-Gurion. Then began the illegal immigration phase immortalized by the Hollywood classic “exodus”. The Bircha “fight” movement started in the Warsaw Ghetto and partisan groups which hunted down Nazis in 1945-46 was also found to organize and fight a guerilla war against the British authorities in Palestine. There were several independent underground militias like the famous Haganah. From Poland, the Zionist Berihah organization was responsible for the organized emigration of Jews from Eastern Europe. Eventually the British authorities under international moral pressure authorized further emigration waves to take place at the rate of 750 refugees per month. The 1947 change of policy from Great Britain, which saw the question passed onto the united nations, led to an organized partition plan. This was followed however by a 1947–1948 Civil War in Mandatory Palestine that saw an increase in military activities by the Arab Liberation Army. At that time, Israeli militias used a large array of improvised armored buses to link besieged areas (like Jerusalem) and facing ambushes and captured back a few Arab Legion armored cars. In 1948, David Ben-Gurion transformed the Haganah into an embryo of a regular army, with obligatory conscription. Eventually, on May 14, 1948, the very day the last British forces left from Haifa, the Jewish People’s Council which held an assembly at the Tel Aviv Museum proclaimed the establishment of a Jewish state in Eretz Israel, soon recognized by USA and the Soviet Union, and quickly followed by a worldwide official recognition except for the neighboring Arab nations. Israel joined the UN on May 11, 1949. Following the declaration of independence, the Haganah became the Israel Defense Forces (IDF), and the Palmach, Etzel and Lehi militias were ordered to cease their operations and joined in. The IDF was first headed by David Ben Gourion as the head of state. Twelve infantry and armored brigades were formed. After some losses in territories by the summer of 1948 tenuous local ceasefires were arranged with the Syrian and Lebanese Arab forces. Armistices were signed in early 1949 with the countries involved, Egypt, Lebanon, Jordan and Syria and the IDF was organized to guard contested borders, later known as the Green Line. 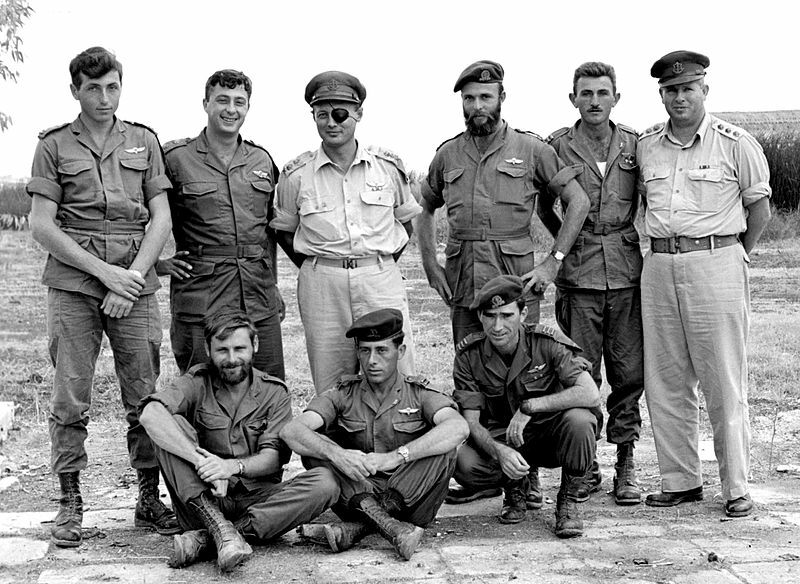 Paratrooper Battalion 890 posing with Moshe Dayan and Ariel Sharon in 1955 after their operation on Kuntila. This arm comprises the maneuvering corps or Infantry Corps (חֵיל הַרַגְלִים) and an Armor Corps (חֵיל הַשִׁרְיוֹן). There were supported by Artillery Corps (חֵיל הַתּוֹתְחָנִים), Combat Engineering Corps (חֵיל הַהַנְדָּסָה הַקְרָבִית) and the Field Intelligence Corps (חֵיל הַאִיסּוּף הַקְרָבִי). In 1983 the Mafchash was established, headed by Dan Shromron. Since 1998, the ground forces were subordinated to the Chief of Staff through the Regional Commands (North, South and Central). It is called the GOC Army Headquarters or “Mazi”. However the distinction of Mazi as a fully independent arm of IDF was proposed in the 2000 reforms but ultimately rejected. 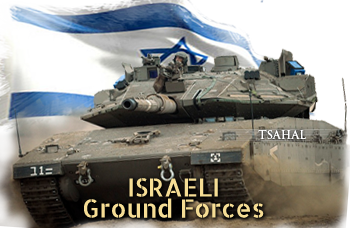 It was to subordinate the ground forces to one ground commander, also a part of the Joint Staff, like the Israeli Air Force and Navy. The actual head of staff of the Mazi is Guy Tzur since 2013. Small for a state, with a narrow territory, Israel can count however on a population of 8,238,300 according to the 2014 census. On that, and an obligatory, universal conscription at 18 years and a potential 1,554,186 males, age 17–49 and 1,514,063 females, age 17–49 (2000 est.) able to take arms if needed. 54,148 males and 47,996 females (2000 est.) reached military service age each year. In total, there is a 176,500 active personnel and 445,000 reserves for all three branches of the army. According to its troubled history with its neighbors, the state of Israel spend 57.7₪ billion (~$16.5 billion) in military expenditure each year or 6.9% of the GDP as of 2011. It is also one of the most (if not the most) feminized army in the world, something historically related to the early “kibboutz” defense held by women as much as men, and imposed by a considerably smaller population than its potential adversaries. On the ground forces, tankers crews could indeed be composed of women, but most are found as army instructors according to statistics. The earliest supplier of weapons was Czechoslovakia in 1948 when an embargo on arms was in place. After an alliance with France which lasted until 1966, Israel counted on the USA until today as its number one military supplier, and more recently Germany (1998). Due to technology transfers, many local adaptations, a strong and innovative weapons and electronics industry grew up, and now Israel is recognized as one of the biggest exporter, well represented in all military fairs and trade shows, with an expertise in some high-tech fields like Drones. On tanks, Israel developed a large array of protection innovations specially developed during the Lebanon war in the 1980s. The US Military adopted many of these, like the Urdan cupola, remote weapons systems, or urban protection kits against RPGs. Israel Military Industries and Israel Weapon Industries are two state-owned giants, followed by suppliers like the Elbit Systems (electronics), Elisra, and Elta. Outside tanks & armored vehicles, the Israeli Army deploys a large variety of hand held RPGs, including the Soviet-built RPG-7, B-300, Shipon, M72 Law, and Matador shoulder-launched rockets. Antitank missiles in service are the Israeli Spike, Lahat, Mapats, nimrod, and the U-built BGM-71 TOW and M47 Dragon. There is no organic air arm attached to the Army, but the air force is capable of doing a serious anti-tank job. In 1967, Mirage-III interceptors were used as ad hoc fighter-bombers, claiming no less than the destruction of 560 enemy planes, mostly on the ground, but also countless tanks & armored vehicles, using napalm. Combat helicopters are the AH-1 “Tzefa” (Cobra), and around 30-40 AH-64A “Peten”, and D “Saraph”. The 25 Boeing F-15E Strike Eagle could also be used for anti-tank strikes. Under this generic denomination, several Soviet tanks models of Egyptian and Syrian origin which had been captured in the war of 1967 and 1973, or even in Lebanon in the 1980s, were reused, sometimes after many modifications, in IDF service. These were numerous (perhaps 300 at some point), and certainly not anecdotal in the total numbers of tanks the Israeli army can field. Here is following the different types in use, with their acknowledged modifications. Source: idf-armour-group.org (see the links below). Added to this .30 cal in MG ring on the loaders hatch, two gas cans on front fenders. 1970s Upgrade (before Yom Kippour war) 105 mm, new TC antenna, TC spotlight with red filter lens, Sherman-type aiming device, fire extinguisher, US headlamps, central .30 cal MG, and after 1973, twin antenna and IDF oil storage box. 1973: Central cal.30, TC’s box & gas cans left side of the hull, central cal .50 over the main gun, rubber ext. rear fenders. Fall 1970s: Front glacis m60 style lights, left folded stretcher, bolted side step, specific operational markings, extra gas cans, ext. rubber fenders. 1980s. “Samovar”: Upgraded engine, thermal sleeve, extra antenna turret right, ERA on glacis plate, 10 round smoke discharger, side skirts, and later Magach style TC cupola, Merkava Turret basket. Tiran 5 Blazer ERA testbed. Squared rear basket, oil storage bin on left rear fender, one central .30 swivel mount, centrally mounted .50 over main gun. Video about the Tirans, by Uri Weiner. The first external operation of IDF came after the nationalization of the Suez Canal by Nasser, which created an outrage in Great Britain and France, due to the strategic nature of this asset. Both countries prepared for a large scale military action, the first after the end of ww2 and Korea. The first military supplier of the young state of Israel then was France. Starting right in May 1948 a strong military, commercial and political relationship began, which lasted until 1969 when De Gaulle limited weapons exports. Between 1956 and 1966 this military assistance peaked with shipments of tanks, guns, aircraft (including the state-of-the-art Mirage-III and even ships). 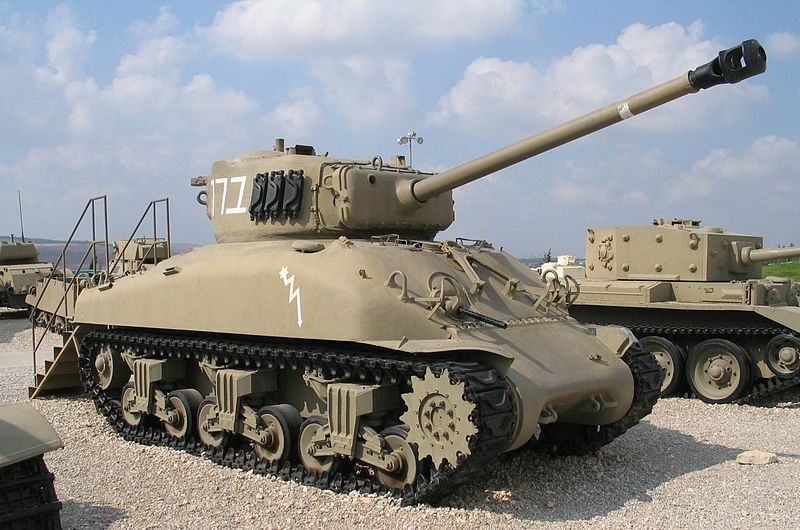 At this time Israeli Tanks were Sherman tanks of various types and origin (nearly 300 in all), and 400 French AMX-13, plus hundreds of FL-11 75 mm guns that served to upgrades Shermans (giving birth to the M50 Sherman) and later FL-12 (M51 Sherman). A map of the tripartite operations in the Sinai against the Egyptian army. 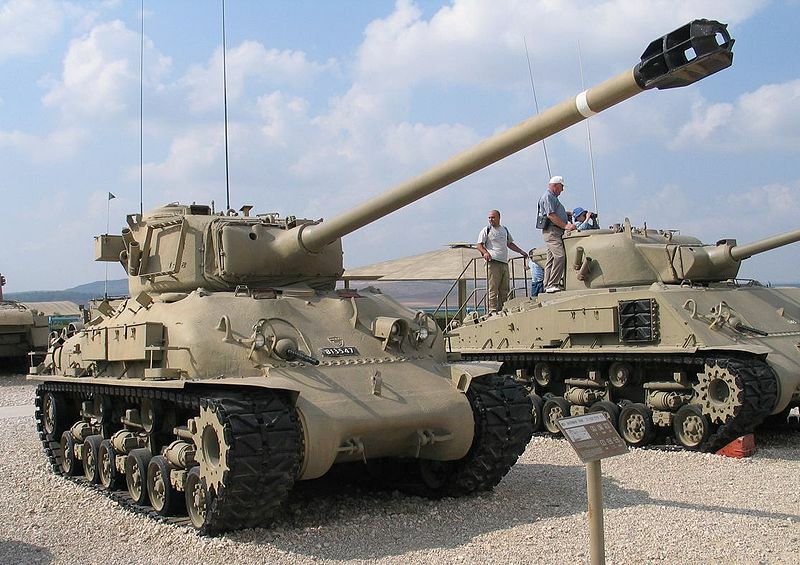 A few of the M50s of the first series participated, together with Israeli AMX-13s to the first major operation by Tsahal (the ground forces of the IDF), called “Kadesh”. This was an operation targeted on the Suez canal east bank as the final objective, and a major action aimed at Sharm el-Sheikh, Arish, Abu Uwayulah, and the Gaza Strip. Meanwhile, the Franco-British forces were supposed to start an air strike campaign and lately landed at Port Saïd (Operation Musketeer and Revise). The Egyptian Army was led by Major General Abdel Hakim Amer, Nasser’s Protégé which armored divisions were equipped with a mixture of Soviet IS-3s, T-34/85s, SU-100s, and Shermans, including hybrids rearmed with FL-11 AMX-13 turrets. The Israeli ground forces were led by Major General Moshe Dayan, which was from the infantry and encouraged aggression, initiative, and ingenuity, but not regarded tanks in great esteem, being for him “clumsy, pricey, and prone to breakdowns”. The operations started on 29 October by parachute drops on several strategic assets (road crossings for the most) in the Sinai. At the same time, the 9th Infantry Brigade captured Ras an-Naqb and progressed to Sharm el-Sheikh while the 4th Infantry Brigade captured al-Qusaymah. At the same time, Ariel’s Sharon brigaded reached Nakla but was found later at the Jebel Heitan into a fierce battle. Several other operations were successful in taking localities on the road to the canal, well supported by air power. The fiercest and largest land battle on 30 October was at the Abu Uwayulah key locality, later called the “hedgehog”. On the beginning of November, Israeli and French aircraft joined in against Egyptian positions, with napalm. The city of Rafah, the Gaza strip was another key objective and one of the most memorable battle. During the operations, AMX-13s of the 27th Armored Brigade were engaged west to take al-Arish. Another tank battle saw the IDF 37th Armored Brigade’s Sherman piercing through the heavily defended Khan Yunis perimeter. On 3 November began the assault on the last objective, Sharm el-Sheikh. The fight was led by infantry (9th division) assisted by tanks, and artillery, plus a diversion by paratroopers. It was all over the 5. When the hostilities stopped on the 7th of November with a general ceasefire, Israeli losses had been of 231 dead and 899 wounded. The IDF gained their objective in the Sinai in keeping control of the Suez canal while re-opening the Tiran Strait. It was learned that highly fluid, mobile operations were the norm in the desert, but after a full control of the sky to allow close-support ground attacks by the airforce. Indeed the French-British Strategic bombing campaign proved ineffective. While the army gained confidence over its capabilities, Israel also escaped the political humiliation suffered by its two allies at the end. The 6-days war. Conquest of Sinai by the IDF. A map of Operation Gazelle, the encirclement of the Egyptian army in 1973. What was learned in all these fights and the diversity of origin the IDF played with forged a very specific way to modify, transform, adapt, and eventually built entire tanks either from an existing basis or from scratch. Indeed, the country being involved in more tank battles perhaps than another in the world, and be involved in several long protracted conflicts of low-to mid-intensity urban combat, developed a whole range of responses. The USA that probably learned the most of this experience was also the chief ally of Israel from 1970 to these days. Indeed, in 1967 and 1973, US military observers gathered an impressive quantity of data about the engagement of mostly allied-built tanks against Soviet-built tanks. Observation of impacts, nature of the explosions, type of ammunition, etc. constituted a pattern of scenarios upon which were built tactics but also helped improved future armors. This knowledge was shared by NATO and helped to create the next generation of MBTs. The first is making extensive modifications of existing tanks, providing new capabilities, and varying in range and depth. The scale starts with the early Tiran-5 barely distinguishable from the original T-54 to the Sabra MBT (based on the M60) destined to the export market and based on the Magach-7 series. 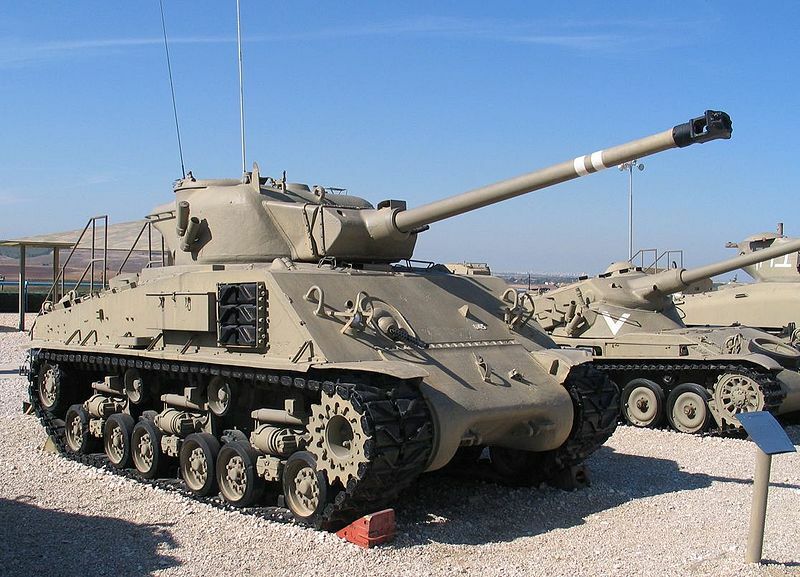 These modifications were done with every single tank in the Israeli Army, starting with the Sherman (M50 and M51), the AMX-13 upgrade package, the Centurion Sho’t, the captured Tiran-4, 5 and 6 (T-54/55/62), Magach-5, 6 and 7. All these improvements were aimed at improving the firepower (the Tiran were given L7 derived 105 mm guns, the M50/51 had 75 mm and 105 mm French guns), mobility (with powerful American engines fitted on some Tirans and the AMX-13 for example), and perhaps moreover protection. For example, the Magach 6 Blazer Era was the first tank to feature this active protection in a zone of war. ERA became mandatory on frontline IDF tanks in the 1980s even before being adopted by other NATO countries. Protection in urban combat gave remote controlled MGs, shield-protected MGs, new cupolas (like the TC Urdan), extra protection against RPGs under the form of chains to block shot-trap passages, new side skirts designs, new grid-like shields, and moreover it was reflected on the scale of modifications on the Magach-7, basically a far up-armoured M60, and on the Merkava series. The second direction is proper tank design, began in the late 1960s when Israel thought to build the Chieftain under license. Israel Tal indeed worked on a design very much influenced by the Chieftain, but adopted several postures dictated by battlefield experience and reports, that ended as a truly original tank. The Merkava (“chariot”) is perhaps one of the best protected BMT on the planet today, but it is certainly the one on which the crew survival has the highest score in case of a fatal hit… This is due to a unique configuration. Unlike virtually all MBT in service today, the Merkava is built with its engine on the front, not on the rear. This is not due by some technical convenience but only with the security of the crew in mind. Since the chances of a frontal hit by another tank is statistically more likely to happen in combat conditions, the engine acts as another layer of protection, shielding the crew behind by its whole length and own complexity. A straightforward idea, that comes with others benefit. The crew not only can escape or enter the tank from a rear trap, the interior is roomy enough to accommodate a half platoon. Plus, for the infantry crawling behind in close combat, the absence of the usual rear engine hot exhausts allows them to come closer and be better protected. In combat, Merkavas were used as improvised heavy APCs and ambulances, leading to a series of conversions, like the Namer APC. The third direction is total reconversion of existing tanks. The Sherman is one of the best early examples of this. The M-50 155 mm, Ro’em, Makmat 160 mm SPGs, but also the MAR-240, Episkopi (MAR-290), Kilshon (all rocket-launcher tanks), or the mine-clearing Sherman Morag (Crab), Trail Blazer (Gordon) ARV, the Medical Evacuation Sherman “Ambutank” and the Eyal Observation Post Vehicle. One of the apparent specialty of IDF was to convert tanks into APCs. No less than 250 T-54s, ex-captured vehicles that were already modified as Tiran-4s, were this time completely rebuilt as heavy APCs. Other heavy APCs were built on the Centurion (Nagmachon, Nakpadon…), and on the Merkava (Namer). These heavy APCs were designed with the experience of urban combat, and are tactically integrated to be used in a specific way alongside regular APCs like the M113. The end of the cold war was not presented the same way as Europe or the USA. Wars in the middle east, outside the energy assets of the region, were motivated by territorial and border disputes, and the creation of Israel was a large part in it. But indeed, most of the tanks fielded by the Egyptians and Syrians were of Soviet origin, and the collapse of Soviet Union meant a major supplier was gone. Changes of policy meant Egypt gradually ease its relationships with Israel, as well as Jordan and Syria, until the 2000 camp David summit that defined an “all-or-nothing” frame for peace between Israel and Palestine. As a sign of these decreasing tensions, Israel disarmed or put in reserve large part of its tank arsenal, all the Tirans, Magach and former US-built tanks, and the Merkava 1 & 2 were put in reserve, and depots. 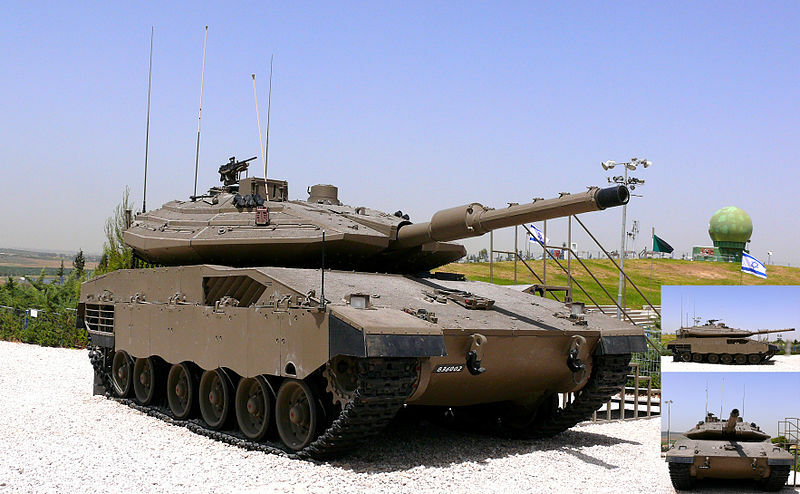 This left the IDF today with only the Merkava 3 & 4, around 980 main battle tanks. Another sign was Egypt’s post-cold war decision to renew its relationships with the West and especially USA, which became once more (it was the case in the early 1950s) its number one provider of tanks, with a massive supply of M60s, and even a licence-built M1 Abrams, or the strongly Tiran-influenced reconversion of old T-54/55s as the Ramses-II, also by an American company. With the growing threat of radical Islamism and ISIS, the ways of warfare are changing fast. When launching innovative concepts around drones, in particular, Israel only shows that intelligence in any operation is absolutely essential, at any level, from the trooper to the strategic command. Other “unofficial” line of intervention, rather secret, includes “web-wars” waged against terrorist organizations, development of counter-measure against nuclear proliferation (remember the Iranian centrifuges virus affair), as well as developing a wide range of less-lethal weaponry like the tactical E-bomb. Armoured vehicles are optimized for urban warfare with more awareness and remote system, including small drones in addition to satellite cover and taking full advantage of a complex battlefield inter-arm intelligence network. Renault R35 (Here exposed at Latrun) previously held by Syrian elements of the Arab Legion, disabled at the kibbutz Degania Alef by a Jewish AT team armed with Molotov cocktails and a 20 mm gun, and reused during the 1948 civil war. There were around 300 Shermans of various origins in service with the Israeli Army from 1950 to 1956. Here is a rearmed M50 Sherman Mk.I derived from the M4A1(76) Continental VVSS series used in the Operation Kadesh in 1956. The 1956 M50 Mark 2 Sherman. Many the M4A4(76) types were rearmed with French FL-11 75 mm guns which had the same firepower and accuracy than the ww2 KWK-42 L/70 (used by the Panther) and fitted with a counterweighted turret and later Cummins VVSS series or M50 Sherman Mark 2. M51 Super Sherman/Isherman this time with the 105 mm FL-12 gun and counterweighted turret. These tanks participated in the 1967 and 1973 wars, proving that a famous ww2 era design was still up to the job against more recent T-55 and T-62s. 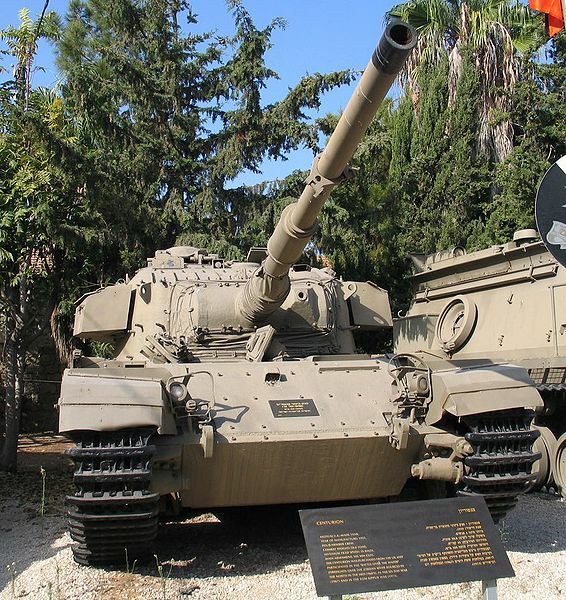 Israeli AMX-13, now on display at Yad la Shiron museum. These light tanks were purchased in 1956 (400 in total) as well as FL-11 guns. Well armed, fast, but lightly protected they were reasonably successful in the rapid campaign of 1956 but fell prey to the Egyptian/Syrian T-54/55 and M48s during the 1967 war, especially in the 4th Mechanized Bigade. AMX-13s were eventually modernized in the 1970s with the NIMDA Upgrade Package and kept in service until the 1990s while the remainder were sold to Singapore. The TCM-20 Hatzerim was the standard AA support vehicle of the Israeli Army in the 1950s-1960s. M3 ARV of the Israeli Army, now preserved. Some were used until the 1980s. 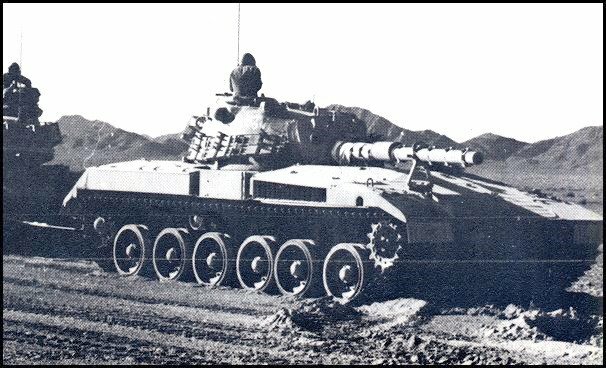 IDF Centurion, probably the best known early Israeli tank, 350 in service, highly successful against Soviet-built T-54/55 and T-62 in the 1967 and 1973 wars. Now deactivated, a significant number of ageing Centurions were modernized in the 1970s as the Sho’t Kal. The 200 M48 Pattons operated by the IDF were modernized and called Magach-5. Now all are retired. E8/Magach-5 Golan based on the M48A5 Patton. The 560 M60 Patton purchased were modernized and modified to Israeli needs as the Magach-6. The Blazer ERA was the first to introduce active protection in combat Lebanon, in the 1980s. Magach-7, a modernized version of the mid-1980s based on the M60 Patton, 1040 in total were upgraded that way. They are now retired. An evolved version, the Sabra, is now in service in Turkey. Merkava Mark 1 (1979). 250 built until 1982. These were modernized to the Mark 2 standard in 1982-84. Now placed in the Army reserve. 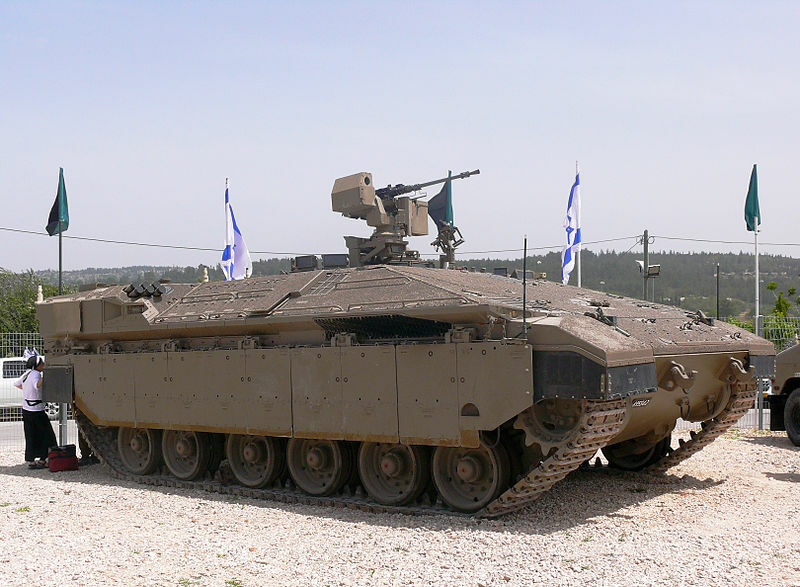 Merkava Mark 2 (1982), 400 built, modernized in the late 1980s and again in the 2000s, now pending reserve. 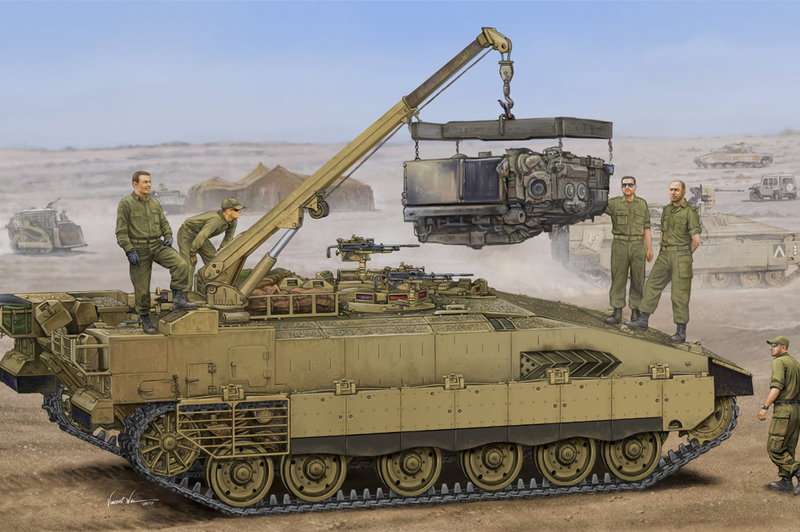 Merkava 3 (1989) the most common type, with 780 machines built and modernized in several batches until recently. Here a Dor Dalet Bar Kazag. Merkava 4 MBT (1999), 360 built, plus 300 on order, in service today. Namer (“Leopard”) heavy APC (2008), derived from the Merkava, 60 built, 250 on order. The M113 was (and still is) the cornerstone of the IDF motorized infantry units, with some 6131 vehicles purchased and in service, replacing gradually the numerous M3 halftracks in the 1970s. They are also declined into a multitude of versions like the Tamuz (missile launcher), the Machbet SPAAG, among others. The Azcharit heavy APC based on the T-54. 250 were so converted. Nagmachon heavy APC. This strange vehicle was based on the Centurion and tailored for urban combat. Built in small quantities (unknown) in par with the Nakpadon, Puma and Nakpuma. 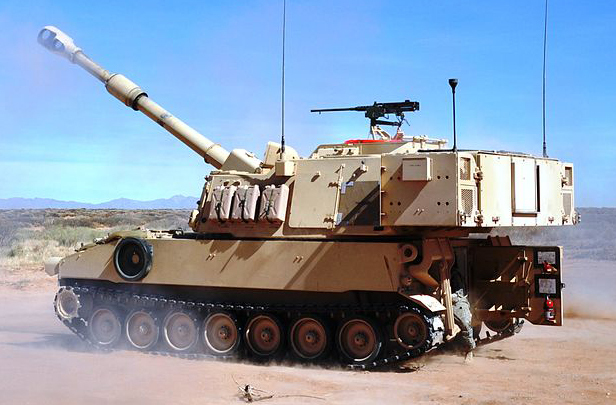 US-built IDF M109 155 mm SPG, 600 in service today. M107 SPG (70 in service during the cold war) now deactivated. Soltam M68 Ro’em of the IDF artillery corps (1968) using the Fiinnish L33 155 Tempella howitzer. Successful at export. Israeli Tiran-6 at Latrun museum.